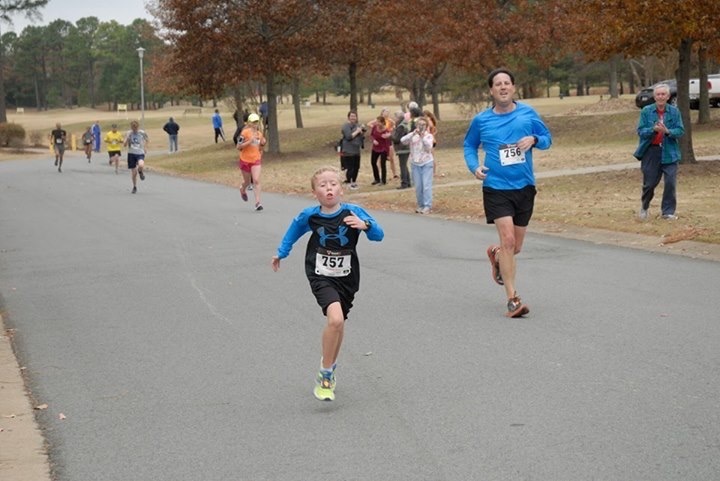 It's a two in one special blog as Braden ran to qualify for the USATF XC Junior Olympic Nationals and had his last road race of the year on Turkey Day. First up...the USATF Arkansas Junior Olympic XC Championships. This particular event was one that has been on the calendar for quiet a while. It has already been a foregone conclusion that Braden would qualify for the Junior Olympic XC Nationals in Albuquerque, New Mexico on December 12. 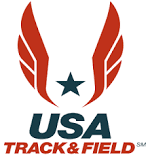 In order to qualify, he had to finish in the top eight in his 7-8 age group and since there are hardly any kids who run distance that participate in USATF here in Arkansas, he was pretty much already locked in (barring an injury or not showing up). Preceding the race, he has been doing a lot of track work and, of course, running a lot of distance events in the Grand Prix and other local races. Even though distance is never an issue, especially since his age group runs the 2K distance for XC, he has been really working on his speed to get faster and faster. In Nationals, Braden will be running against the very best in the country and a lot of kids will already have a leg up on him because they are a year older. A lot of times it doesn't matter as much on the local level because Braden can more than hold his own against older kids in his age division in the distance races, but on the shorter distances (a 2K is 1.24 miles) he has to be really quick to compete against older kids...especially on a national level. When I have worked him out on the track here recently, he has been running the 2K distance at around 9:00. The thing is, though, cross country races are not flat track-like surfaces, so I knew the 9:00 time was a little deceiving. Historically, there are about 200 runners that participate in his age group at Nationals and a 9 minute time would place him around the top 100 and he would have to run close to an 8 minute time to place around the top 25 and get a medal. The nice thing is that in the spring, he had been running the 2K in about 10 minutes, so his time has improved quite a bit. Originally the race was supposed to be in Little Rock, which was great because we wouldn't have had to travel that far, but a few days before the race, something happened with the group that was putting it on in Little Rock and we found out that we would now have to race in Nashville. Nashville is off the beaten path and a 2 1/2 hour drive from our house, so needless to say, I wasn't pleased with the change in venue. Thankfully, they made adjustments to the start time and Braden didn't have to run until 10 a.m. The people who organized the event put together a nice course at the Nashville City Park, especially on such short notice, but because of all the twist and turns, it was necessary for the runners to have a four-wheeler lead the runners through the course. I was a little concerned about the rain that was forecast, but it had pushed out by the time we reached the park. The temperature was a little brisk, but most of all it was very windy at 12-15 mph! Because of the last minute change in location, a lot of runners did not show up, including the one boy that Braden was going to race against in his group. This meant that Braden would have to run by himself, since his age group is the only one to run the 2K distance. Braden hopped on the four-wheeler to take him to his starting line and he was instructed to take off at the sound of the air horn. Unfortunately he lost a few seconds after the air horn sounded because the four-wheeler didn't take off. He hesitated because he didn't want to pass it up so he got off to a little of a slow start. To be honest, I didn't think he would do that great since he was by himself and it was windy, but he proved me wrong. From a distance, it didn't look he was running that fast, but the other runners were saying that he was going pretty quick. When he came into view to go the final 100 meters, he was flying, so much to the point, he passed the four-wheeler before crossing the finish line. When I got to the finish line to see how he did, the officials said he clocked in at 8:56 (a 7:12 minute per mile pace)! 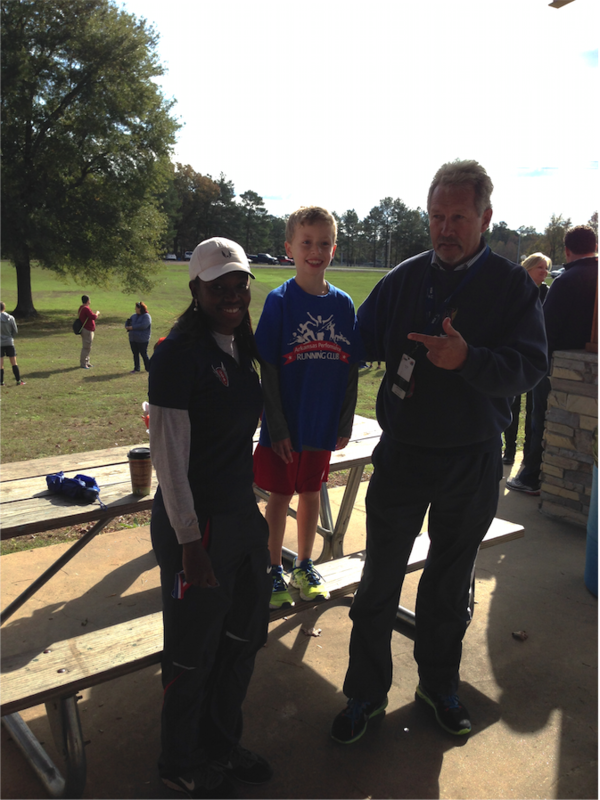 The head of USATF Arkansas said that he was very impressed by his time and said Braden was a very fast runner for his age. I couldn't help to think what his time would have been if it wasn't for the hesitant start and if he could have run against someone else. Braden knew that he could've walked the course and still won a gold medal, but he gave a full effort and ran his best time at that distance. Overall, I was very happy with his performance and really look forward to what he can do against the nation's best in a few weeks when we travel to Albuquerque! After Braden's short race, we had a quick turnaround for our final road race of the year on Thanksgiving at the Turkey Trot 5K. Braden, as you know, has kicked it into another gear this month and has seen his 5K and 10K PRs fall by the wayside as his pace has ramped up dramatically. Knowing this was the final race of the year (other than USATF), he wanted to set another PR. This was the first year for the Turkey Trot 5K, put on by the United Way, and after driving most of the course prior to the race, I knew he had a very good shot at setting that new PR because it was mostly flat. Most of the course winded it's way around Centennial Country Club (which has a very nice neighborhood) and through the Country Club's golf course. Once again we were keeping our fingers crossed concerning the weather, and once again the rain came before the race. The winds were about 8 mph, but it was overcast and in the low 60's...a lot nicer than what it could've been. I told Braden that I would let him lead us and he said that he wanted to run at a 7:35 pace. Since it was their first year putting on the event, there was some things that didn't go quite right The start to the race was abrupt to say the least. After the lone wheelchair racer headed off we stood by waiting for a countdown to when we would begin and before you know it, the pistol went off without a countdown or a ready, set, go. I think everyone was just as startled as we were, but we really didn't lose any time getting out of the starting area. We settled into our first mile pretty quick and navigated up the only part of the course I would call a hill. We didn't have to fight through many runners since most of the ones in front of us were high school cross country types, but we did get to run most of the race with one of our Conway Running Club teammates who Braden has never been able to keep up with before, so he was excited by that. Braden's first mile came in at a 7:22 pace and he said he was feeling great. Our second mile took us on the golf course cart path, which was uneven and rolling (as you would expect from a golf course), and because I was feeling good, I kept ahead of Braden by a few meters to push him a little more. After exiting the golf course, we had a nice slight downhill and then started heading into the wind. This took just a small toll on Braden as he finished the second mile at a 7:55 pace. See, Braden isn't the only who throws up at the finish!! A little into the third mile, we once again got back on the golf course to head towards the finish. We were able to pass some older kids in their cross country attire (which made Braden feel real good) and he started to pick up the pace as I was encouraging him that we weren't too far away from the finish and I knew a new PR was in sight. As we made our final turn off of the golf course for the final .10, I slowed it up and let him rocket past me with his patented kick so I could cheer him on to the end. His third mile pace was at 7:50 and the last .10 at 6:44. Braden crossed the line with a time of 23:23, setting another PR by 40 seconds and he beat his goal by running a 7:32 minute per mile pace!! He came in first in his age group and because he is getting faster, it is making me go all out as well, which allowed me to finish third in my age group. Even neater, from my perspective, was him and I finishing 24th and 25th out of 243 runners overall! At the awards ceremony, the organizers admitted that they had messed up because they didn't anticipate anyone under 10 running in the race, so they made some adjustments as Braden and I both received a bag of goodies. For some of the minor issues they did have, they had a lot of good things as well. Everyone received a nice turkey spinner medal and the food/drinks and kids activities was really nice. Overall, it was a great experience that I'll put on the calendar each Thanksgiving. After Braden's Junior Olympic event in New Mexico, our next "road race" will actually be a Grand Prix one-hour track run on January 24 and we'll also be ramping up Braden's mileage a little bit because he wants to run the Grand Prix River Trail 15K (9.3 miles!) on February 6. I only have only a couple of more blog entries before the end of the year. I hope they've been as nice to read as they've been as fun to write...it's been a blast! !